Gordon Matta-Clark, scion and rebel, died at 35 in 1978 and has since become a cult figure of late-twentieth-century art. Born in New York and trained in architecture at Cornell, he went on to question the field's conventions in vivid projects that excised holes into existing buildings or assembled deeds to New York City alleys and curbs. His work and words, while sophisticated enough to make him an "artist's artist," and colossal and outgoing enough to draw public attention and affection, were always also grounded in social or political convictions. 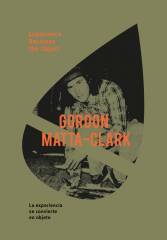 This book collects five essays and ten individual interviews to different friends and family members of Gordon Matta- Clark serve to outline a biographical profile and an analysis of the historical period in which the artist developed his short and successful career. New unpublished material and photos plus an exclusive link to the documentary "Crosswords: Matta- Clark's friends" (2014) by Matias Cardone are included.